« SU does it again! Fabulous specials each and every week during the month of June! This week end has been a team training time for some members of my team “The Bent Ink-Linations”. The girls travelled from near and not so near for two days and nights of bonding, stamping, chatter and chocolate (not necessarily in that order). We’ve had a great time and I’m feeling quite sad that they’ve now gone home. We’ve had a great time together getting to know each other and exchanging ideas etc. Everyone brought a shoe box swap so all have gone home with lots of creative ideas and lovely memories. 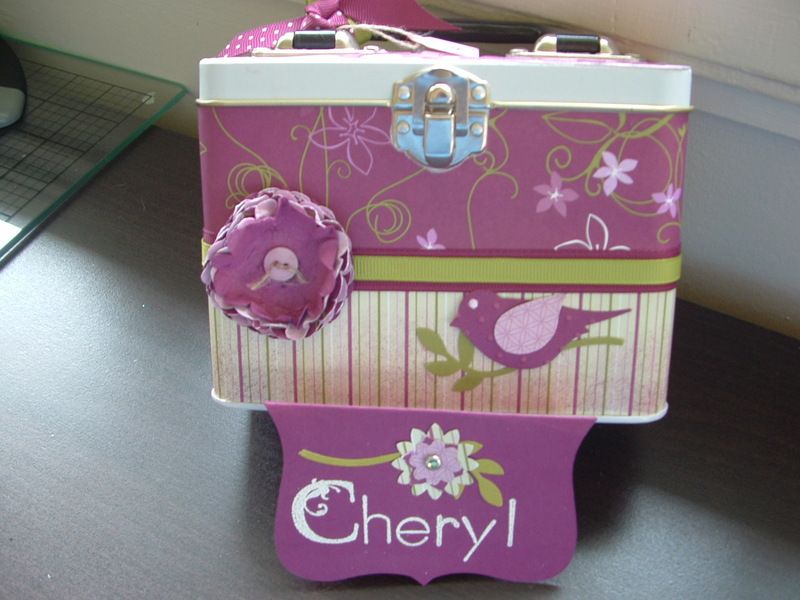 For the last week I have been decorating lunch-box tins and making place cards for the girls. Each tin was different, sorry I didn’t get a photo of them all together, but once they clapped eyes on them, they were gone! The tins were full of yummy chocolate of many types. I just wanted to create something that the girls would use again on their craft desks that would remind them of their week end on the Tablelands. Thanks for making the effort to come girls and thanks for the memories! Cannot wait to do it all again. I just want to let you know that you have been awarded the Swap Sisters Bonny Blog Award. 1: Put the Swap Sisters Bonny Blog Award on your blog and/or within your post. 2: Share 5 things about yourself. 3: Pass the award onto 5 other Bonny Blogs. 4: Put links in your post of your 5 chosen Bonny Blog Winners. 5: Let them know they have been chosen to win the Swap Sisters Bonny Blog Award by leaving a comment on their blog. 6: PAY IT FORWARD and link the person from whom you received the Swap Sisters Bonny Blog Award.